CERSAIE is one of the essential annual events for all companies in the sector, where the most important firms exhibit new and exclusive products and advances in the industry. 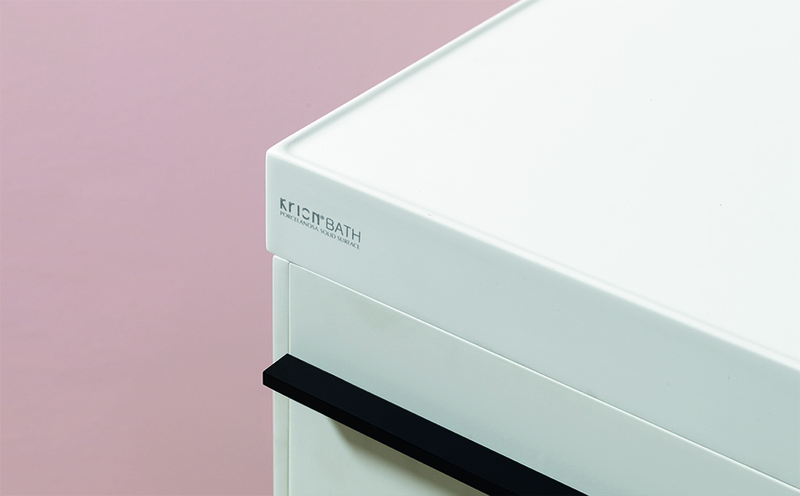 Continuing with the new products exhibited at CERSAIE 2018, KRION® Bath has presented two new bathtub series and a new shower tray, exhibited at the PORCELANOSA Group stand. NEST presents smooth, rounded lines, inspired by asymmetrical forms with an exquisite presence, where design flows as gently and naturally as water. This careful design without corners makes its maintenance and cleaning quick and easy, prolonging its durability. The series is made up of several elements which offer a wide range of options: countertops, units, metallic chassis and accessories, with KRION® finishes on the countertops and black and white lacquer finishes on the other elements. SMART is made up of a KRION® countertop and a suspended wooden unit. The oval embedded washbasin, made up of one or two basins, has an integrated overflow and can be installed independently or accompanied by a suspended unit with large single or double removable drawers, and finishes in taupe oak and ash coloured oak. The SMART series also includes the option of a metallic chassis with a wooden or metallic shelf. It is designed to be installed quickly and for its maintenance to be easy, without reducing aesthetics or functionality. With an innovative design so that water flows naturally without the possibility of standing still, thanks to its slanting surfaces. The large 90mm drain allows the water to be drained easily, and has a stainless steel cover. SLOPE has a large shower area surrounded by a fine frame which is unnoticeable when stepping in, allowing the installation of any shower screen on the market, stopping splashes from landing outwith the shower tray. The SLOPE shower trays are made with KRION Shell®, an Engineered Mineral Composite made up of a primary structural body and an advanced surface layer. It is available in 5 colours and 2 textures. Renewed lines of decorative finishes in the ATTICA and S+ LINE shower screen series in addition to the new trends. Horizontal and vertical parameters maintaining the fluidity and purity of the lines characterising them are prominent. The new finishes give an air of distinction and great presence when integrated into the modern bathroom. Available in matte black.